Menu designs tend to all look the same after a while, as new ideas get picked up, become a trend, and get adopted more broadly. 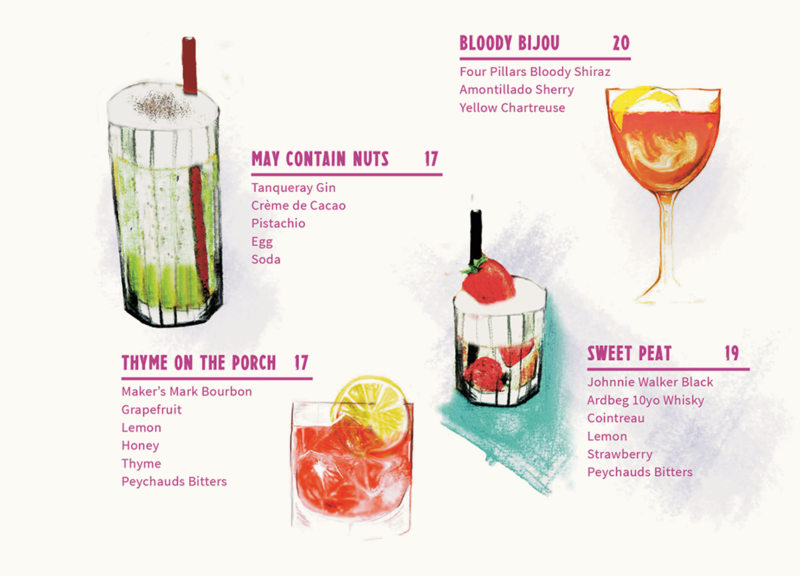 So, it’s refreshing to look at Halford’s cocktail list — we’re pretty sure there’s no other menu like it. For one, we love the flashy, 80s-style illustrations and colours — they’re like the menu equivalent of a white suit jacket with the sleeves rolled up, West Coast Cooler in hand, and synths on the stereo. 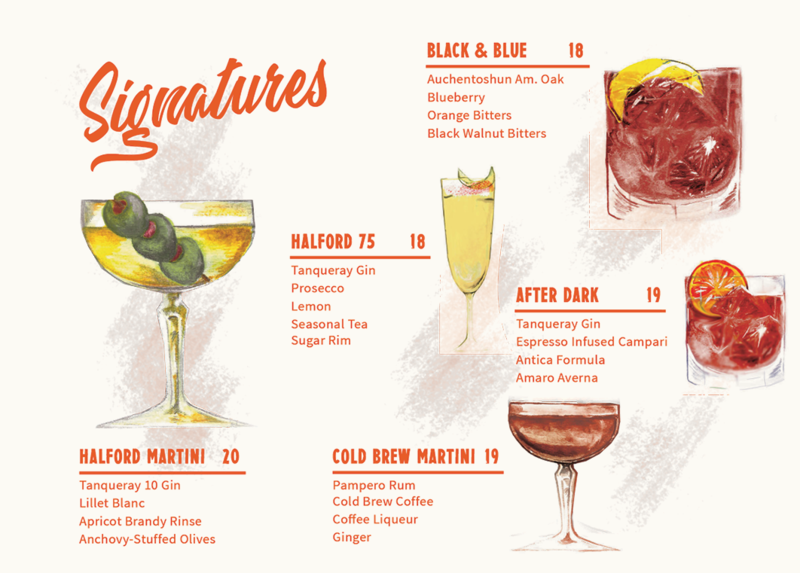 Here we talk to bar manager Joe Sinagra about the ideas behind the list, which are the drinks that work best, and designing a list without pretensions. Tell us a bit about the driving ideas behind the list at Halford? We wanted to put forward a list that was easy and fun. Cocktails have been taken seriously for too long and we wanted to bring it back to focusing on the customer’s enjoyment and pleasure, as opposed to bartender ego. Who came up with the original recipes on the list? The list was a collaborative effort between all the staff. The way we do our drink development is everyone bounces ideas off each other and everyone contributes. Everyone brings ideas to the group in different ways. Some of our less experienced team have flavour combinations or ideas on how they want to apply a particular technique. The more experienced staff have more formed drinks ideas that we discuss how we take to the next level. This process gives the whole team ownership of the menu. Between the team we manage to deliver a pretty fun and tasty list. Which drinks are the most popular with the punters? 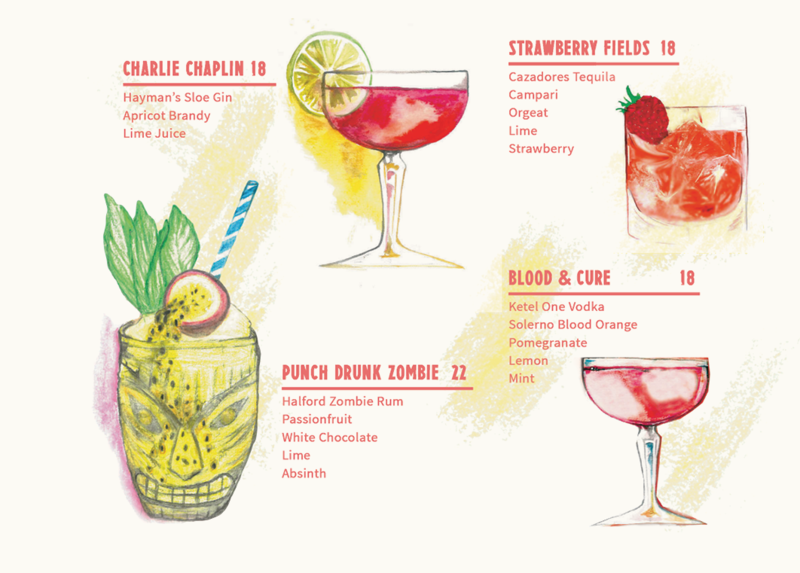 By far the biggest selling cocktail is the Punch Drunk Zombie. Essentially a white chocolate and passionfruit Zombie. We worked on the blend of rums (it’s a blend of three, a white, a Jamaican and an overproof) to really work with the flavours of the drink. Other than the Zombie our Watermelon Spritz is killing it too. I’m really excited about the Spritz as it uses my not so secret indulgence, Watermelon Passion Pop! It’s a really easy cocktail to prepare. A dry gin (we use Tanqueray), some mint-infused dry vermouth (Noilly Prat) and topped with Watermelon sparkling. Quick, tasty and perfect for summer. Tell us a bit about the design of the list. We get all our illustrations done by an artist based locally here in Perth. The illustrations are just another way to help the customer decide what they feel like. Being able to see how the drink is presented means that the guest is super clear about what the drink is and can make an educated decision about what they want. The descriptions focus more on describing the flavours as opposed to how we achieve them. We felt that too often menus can be confusing to customers who don’t really care what’s been roto-vapped/sous-vide/foraged. We find that the customers who are interested in the technical side of how the drinks are prepared will ask. All our staff work both floor and bar so given we do mostly table service it helps that the person taking your order can always talk about the drinks from a technical view as well. 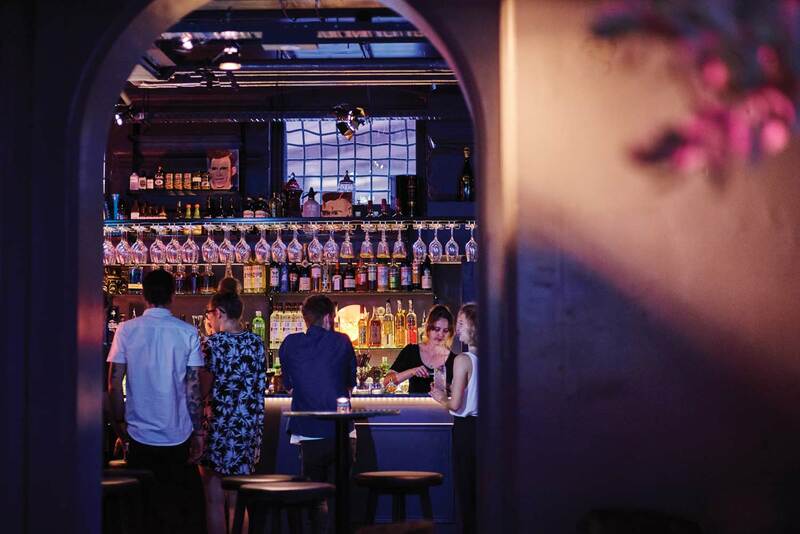 Overall the idea was to create a menu that gave customers the opportunity to enjoy some really fun and lighthearted cocktails without any pretension. Tell us a bit about how the Pandanmonium cocktail came together? Halford is based in the State Buildings development which also houses Wildflower, Petition, Post and Long Chim. We wanted to do an Asian inspired drink as a bit of a tip of the hat to our buddy James Connolly who heads up the drinks for Long Chim and a few of the other bars in the area. Pandan was a flavour that Pat Carpenter who works with us (and has worked under Connolly before) had had some success with and we built it all around Nusa Cana rum which I had been working a bit with. The end result was a refreshing and fun cocktail that’s quite popular. Get a look at the Pandanmonium recipe here.